Several terms redirect here. For other uses, see Star map (disambiguation) and Star chart (disambiguation). The oldest known star chart was drawn 5000 years ago by the Indias in Kashmir, which also depict a supernova for the first time in human history. The oldest known star chart may be a carved ivory Mammoth tusk drawn by early people from Asia that moved into Europe, that was discovered in Germany in 1979. This artifact is 32,500 years old and has a carving that resembles the constellation, although it could not be confirmed and could also be a pregnancy chart. Orion. A drawing on the wall of the Lascaux caves in France has a graphical representation of the Pleiades open cluster of stars. This is dated from 33,000 to 10,000 years ago. Researcher Michael A. Rappenglueck has suggested that a panel in the same caves depicting a charging bison, a man with a bird's head and the head of a bird on top of a piece of wood, together may depict the summer triangle, which at the time was a circumpolar formation. Another star chart panel, created more than 21,000 years ago, was found in the La Tête du Lion grotto. The bovine in this panel may represent the constellation Taurus, with a pattern representing the Pleiades just above it. Rappenglueck also discovered a drawing of the Northern Crown constellation in the cave of El Castillo (North of Spain), made in the same period as the Lascaux ones. The Nebra sky disk, a 30 cm wide bronze disk dated to 1600 BC, bears gold symbols generally interpreted as a sun or full moon, a lunar crescent, several stars including the Pleiades cluster and possibly the Milky Way. The oldest accurately dated star chart appeared in ancient Egyptian astronomy in 1534 BC. The earliest known star catalogues were compiled by the ancient Babylonian astronomers of Mesopotamia in the late 2nd millennium BC, during the Kassite Period (ca. 1531–1155 BC). The oldest records of Chinese astronomy date to the Warring States period (476–221 BC), but the earliest preserved Chinese star catalogues of astronomers Shi Shen and Gan De are found in the 2nd-century BC Shiji by the Western Han historian Sima Qian. The oldest Chinese graphical representation of the night sky is a lacquerware box from the 5th-century BC Tomb of Marquis Yi of Zeng, although this depiction shows the positions of the Chinese constellations by name and does not show individual stars. The Farnese Atlas is a 2nd-century AD Roman copy of a Hellenistic era Greek statue depicting the Titan Atlas holding the celestial sphere on his shoulder. It is the oldest surviving depiction of the ancient Greek constellations, and includes grid circles that provide coordinate positions. Because of precession, the positions of the constellations slowly change over time. By comparing the positions of the 41 constellations against the grid circles, an accurate determination can be made of the epoch when the original observations were performed. Based upon this information, the constellations were catalogued at 125 ± 55 BC. This evidence indicates that the star catalogue of the 2nd-century BC Greek astronomer Hipparchus was used. A Roman era example of a graphical representation of the night sky is the Ptolemaic Egyptian Dendera zodiac, dating from 50 BC. This is a bas relief sculpting on a ceiling at the Dendera Temple complex. 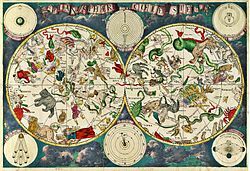 It is a planisphere depicting the zodiac in graphical representations. However, individual stars are not plotted. The oldest surviving manuscript star chart was the Dunhuang Star Chart, dated to the Tang dynasty (618–907) and discovered in the Mogao Caves of Dunhuang in Gansu, Western China along the Silk Road. This is a scroll 210 cm in length and 24.4 cm wide showing the sky between declinations 40° south to 40° north in twelve panels, plus a thirteenth panel showing the northern circumpolar sky. A total of 1,345 stars are drawn, grouped into 257 asterisms. The date of this chart is uncertain, but is estimated as 705–10 AD. Star chart of the south polar projection for Chinese astronomer Su Song's (1020–1101) celestial globe. During the Song dynasty (960–1279), the Chinese astronomer Su Song wrote a book titled Xin Yixiang Fa Yao (New Design for the Armillary Clock) containing five maps of 1,464 stars. This has been dated to 1092. In 1193, the astronomer Huang Shang prepared a planisphere along with explanatory text. It was engraved in stone in 1247, and this chart still exists in the Wen Miao temple in Suzhou. In Muslim astronomy, the first star chart to be drawn accurately was most likely the illustrations produced by the Persian astronomer Abd al-Rahman al-Sufi in his 964 work titled Book of Fixed Stars. This book was an update of parts VII.5 and VIII.1 of the 2nd century Almagest star catalogue by Ptolemy. The work of al-Sufi contained illustrations of the constellations and portrayed the brighter stars as dots. The original book did not survive, but a copy from about 1009 is preserved at the Oxford University. Perhaps the oldest European star map was a parchment manuscript titled De Composicione Spere Solide. It was most likely produced in Vienna, Austria in 1440 and consisted of a two-part map depicting the constellations of the northern celestial hemisphere and the ecliptic. This may have served as a prototype for the oldest European printed star chart, a 1515 set of woodcut portraits produced by Albrecht Dürer in Nuremberg, Germany. During the European Age of Discovery, expeditions to the southern hemisphere began to result in the addition of new constellations. These most likely came from the records of two Dutch sailors, Pieter Dirkszoon Keyser and Frederick de Houtman, who in 1595 traveled together to the Dutch East Indies. Their compilations resulted in the 1601 globe of Jodocus Hondius, who added 12 new southern constellations. Several other such maps were produced, including Johann Bayer's Uranometria in 1603. The latter was the first atlas to chart both celestial hemispheres and it introduced the Bayer designations for identifying the brightest stars using the Greek alphabet. The Uranometria contained 48 maps of Ptolemaic constellations, a plate of the southern constellations and two plates showing the entire northern and southern hemispheres in stereographic polar projection. The Pole Johannes Hevelius finished his Firmamentum Sobiescianum star atlas in 1690. It contained 56 large, double page star maps and improved the accuracy in the position of the southern stars. He introduced 11 more constellations (Scutum, Lacerta, Canes Venatici, etc.). ^ Whitehouse, David (January 21, 2003). "'Oldest star chart' found". BBC. Retrieved 2009-09-29. ^ Lucentini, Jack. "Dr. Michael A. Rappenglueck sees maps of the night sky, and images of shamanistic ritual teeming with cosmological meaning". space. Retrieved 2009-09-29. ^ Sparavigna, Amelia (October 2008). "The Pleiades: the celestial herd of ancient timekeepers". arXiv:0810.1592v1 [physics.hist-ph]. ^ "BBC News - SCI/TECH - Ice Age star map discovered". news.bbc.co.uk. Retrieved 13 April 2018. ^ von Spaeth, Ove (2000). "Dating the Oldest Egyptian Star Map". Centaurus International Magazine of the History of Mathematics, Science and Technology. 42: 159–179. Bibcode:2000Cent...42..159V. doi:10.1034/j.1600-0498.2000.420301.x. Retrieved 2007-10-21. ^ North, John (1995). The Norton History of Astronomy and Cosmology. New York and London: W.W. Norton & Company. pp. 30–31. ISBN 0-393-03656-1. ^ Sun, X.; Kistemaker, J. (1997). The Chinese Sky During the Han: Constellating Stars and Society. Koninklijke Brill. pp. 21–22. ISBN 90-04-10737-1. ^ Sun, X.; Kistemaker, J. (1997). The Chinese Sky During the Han: Constellating Stars and Society. Koninklijke Brill. pp. 18–19. ISBN 90-04-10737-1. ^ Schaefer, Bradley E. (May 2005). "The epoch of the constellations on the Farnese Atlas and their origin in Hipparchus's lost catalogue". Journal for the History of Astronomy. 36/2 (123): 167–196. Bibcode:2005JHA....36..167S. ^ Evans, James (August 1999). "The Material Culture of Greek Astronomy". Journal for the History of Astronomy: 237–307, 289–290. Bibcode:1999JHA....30..237E. ^ a b Whitfield, Susan; Sims-Williams, Ursula (2004). The Silk Road: trade, travel, war and faith. Serindia Publications, Inc. pp. 81–86. ISBN 1-932476-13-X. ^ a b c Bonnet-Bidaud; Jean-Marc; Praderie, Françoise; Whitfield, Susan (March 2009). "The Dunhuang Chinese sky: A comprehensive study of the oldest known star atlas". Journal of Astronomical History and Heritage. 12 (1): 39–59. arXiv:0906.3034. Bibcode:2009JAHH...12...39B. ^ Bonnet-Bidaud, Jean-Marc (2009-06-27). "The Oldest Extand Star Chart". Institut de recherche sur les lois fondamentales de l'Univers. Retrieved 2009-09-30. ^ Harley, John Brian; Woodward, David (1987). The History of cartography. 2 (2nd ed.). Oxford University Press US. pp. 60–61. ISBN 0-226-31635-1. ^ Hearnshaw, J. B. (1996). The measurement of starlight: two centuries of astronomical photometry. Cambridge University Press. pp. 9–10. ISBN 0-521-40393-6. ^ Swerdlow, N. M. (August 1986). "A Star Catalogue Used by Johannes Bayer". Journal for the History of Astronomy. 17 (50): 189–197. Bibcode:1986JHA....17..189S. Wikimedia Commons has media related to star charts. Sky Chart – Free Northern Sky Chart Cutout. The Evening Sky Map – Free monthly star charts and calendar for northern hemisphere, southern hemisphere, and equatorial sky watchers. Stellarmap.com – Online map of the stars (requires compatible browser such as Chrome, Opera, Firefox, Safari or IE9).